You want a THEME or IDEA for a post? How about sharing a song on Wednesday that Inspires you, along with the lyrics and the story of why it inspires you. BeWoW stands for Be Wonderful on Wednesday. #BeWow is one word. But really you don’t have to wait for Wednesdays. The idea is to post something about Wonderful on Wednesdays, though. There is also the #BeWATT which is for Be Wonderfull All The Time. You can use that any time and I will RT it when I see it and maybe others will as well. I’ll put out another post about #BeWATT soon, but this post is for #BeWoW. This is an EVERY WEEK THING so by reading this once all the way through, you’ve got it and only need to refer to it each week if you need to. But read it through at least once. If something changes. I’ll put out a special post about it. Write a post and share it on Twitter with the #BeWoW and I and others will RT it. If you want to make sure I RT it also include @RonovanWrites when you share it. This Explained in More Detail with My Post as an Option. 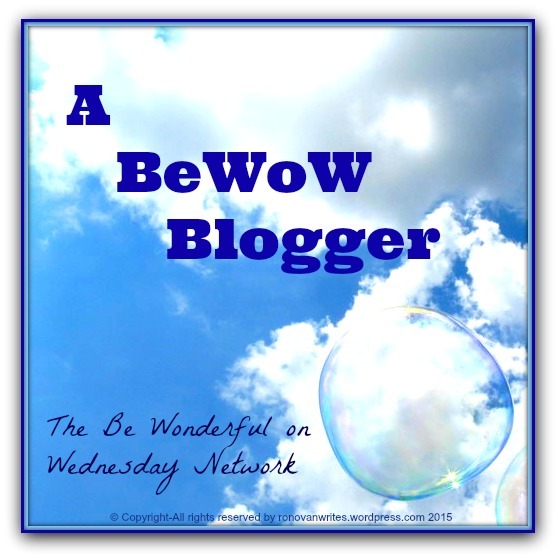 Each Wednesday a post will show up here on RonovanWrites about something Wonderful for me or maybe a #BeWoW Guest Blogger will show up. Post a link to your Wonderful post in the comments to share with everyone. That’s one way it works. Simple as that. Then there is the Twitter way. Happy St Patrick’s Day, Ronovan. Last sentence: The there is the Twitter way. Never mind if is on poipoise! Oh, and it’s a lovely idea. I have angel/devil thursdays where the devil on one shoulder argues with the angel on the other, but the devil sulked last week and refused to perform….. I know some of you are on board already, but for those who haven’t stumbled upon this fantastic blogshare concept by Ronovan – check this out! Awesome idea for a blogshare.